Bruce Li (left) walking in Hong Kong with Big Boss co-star Nora Miao, September 3, 1971. 1. His nickname growing up in Hong Kong was King Gorilla. 2. He’s credited as influencing the Mixed Martial Arts (MMA) movement. 3. He developed Jeet Kune Do from Wing Chun and other martial arts. 4. He lived two streets away from Chuck Norris in L.A.
5. Steve McQueen had his manager find Bruce Lee a house in Bel-Air, Los Angeles. 6. He was the first proponent of protein shakes. 7. His one and only boxing match was at St Francis Xavier College boxing club. 8. His uncle was Hong Kong’s first citizen to be knighted, Sir Robert Hotung Bosman. 9. The small town of Anderson, California has equipped its police officers with nunchucks. 10. Gangs in the UK were also said to have taken up use of nunchucks after Enter the Dragon became a worldwide hit. 11. There is a Bruce Lee statue in Mostar, Bosnia. 12. The first Bruce Lee statue unveiled in America was in Chinatown, Los Angeles in 2013. 13. Uma Thurman’s outfit in Kill Bill 1 was modelled on Bruce Lee’s from his final film Game of Death. 14. 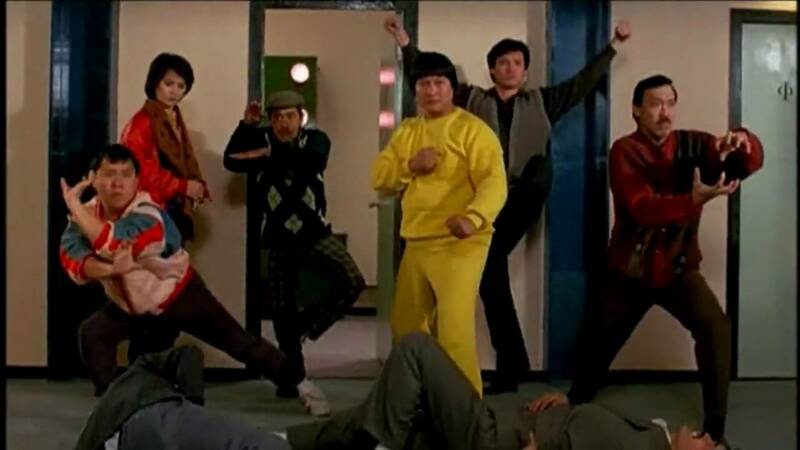 Sammo Hung’s outfit in My Lucky Stars was a satirical salute to the Game of Death yellow jumpsuit. 15. He was an atheist. 16. He once won the Crown Colony Cha-Cha competition in 1958. 17. He lived on Nathan Road as a child. 18. He shared a flat with up to 20 people and dogs, birds and fish including his favourite, an Alsatian named Bobby. 19. Bruce’s best friend growing up was Siu Kee Lun, nicknamed Unicorn. 20. His father was an actor in Chinese Opera. 21. As a child, Bruce told his mother he would be a famous movie star. 22. He didn’t go to school much but always told his mother where he was playing. 23. He was a sickly child. 24. His birth name is Lee Jun-fan. 25. Lee was born in the zodiac hour of the dragon in the year of the dragon. 26. He was nicknamed Little Dragon by his sister Agnes. 27. Jackie Chan said after Lee hit him with a stick on set he exaggerated the injury so that Lee would continue to hold him to make him feel better. 28. He was a sleepwalker. 29. The rest of family called him Mo Si Tung or Never Sits Still. 31. He read a lot as a boy. 32. His first film was Cantonese-US production Golden Gate Girl when he was three months old and still in San Francisco (he played a baby girl). 33. There are at least 10 video game characters based on Bruce Lee. 34. At six he was in a Hong Kong film called The Birth of Mankind with Unicorn. They were street kids fighting in the film. 35. Bruce was a few months old when he came to Hong Kong from the United States in 1941. 36. He played other roles credited as Lee Siu Lung or Lee Little Dragon. 37. By the time he was 20 years old he'd made 20 films. 38. He was usually cast as an urchin or a delinquent. 39. He returned to US aged 19. 40. Aged 24 he met Jhoon Rhee, known as the father of Tae Kwan Doe in America, and developed a lifelong friendship. 41. He vowed to be a bigger star than Steve McQueen and James Coburn. 42. He suffered a back injury in the early 1970s but continued to act. 43. Injury stopped his goal of becoming the highest paid Asian film actor. 44. His favourite meal was beef with oyster sauce. 45. There are statues of him in four countries. 46. Every major fighting computer game series has a character based on Lee. 47. He was afraid of water and couldn’t swim after his sister held him under the surface when they were playing in Clearwater Bay. He was 12. 48. He also couldn’t ride a bicycle after a couple of falls. 49. He once asked his brother to stab him, only to practise disarming his assailant. He knocked the knife away before it came anywhere near him. 50. Lee said celebrities paid him up to US$100 an hour for kung fu lessons ... that's the equivalent of HK$6,293 an hour today. 51. He was a practical joker and liked to show off his abilities, including magic tricks. 52. His master, Ip Man, secretly enjoyed all of Lee’s practical jokes. 53. He said he studied philosophy at the University of Washington but according to the University he majored in drama. 54. Enter the Dragon was banned in Singapore for promoting long-hair culture. 55. Bruce Lee’s left leg was an inch shorter than his right. 56. Lee was posthumously given Beijing’s Chinese Wushu Association’s first award for achievement in November 1998. 57. Lee didn’t drink or smoke but he used Nepalese hash, according to articles and biographies (SCMP, 1996/Bruce Thomas). 58. Ip Man’s nickname for Bruce Lee was ‘upstart’. 59. Lee died within a year of his master, Ip Man. 60. Ip Chun, 91, son of Ip Man, considers Wing Chun a health regime. 61. His daughter Shannon Lee still runs businesses associated with Bruce. 62. She said she has had marriage proposals from her father’s fans she’s never met. 63. Chuck Norris said Bruce Lee was the one person he couldn’t beat in a fight. 64. Bruce Lee nearly couldn’t walk after a back injury caused by lifting weights with Kareem Abdul Jabbar. 65. Lee and Norris once trained in a hotel hallway for eight hours. 66. Bruce Lee taught his son Brandon Lee martial arts from the time he could walk. 67. According to Brandon, Bruce received a lot of flak for teaching martial arts to Caucasians as it was considered an “Asian secret weapon”. 68. Bruce had to move to the US after getting into fights as a teen. 69. His last street fight as a teen in Hong Kong was said to be on the roof of a 16-storey Nathan Road block that still stands. 70. Bruce’s wife Linda Caldwell said she enrolled in his kung fu classes after she saw him drop off another woman at her high school. She was 17 and he was 22. 71. Bruce and Linda’s first date was at the Seattle Space Needle on October 25, 1963. 72. Steve McQueen said he would fly Bruce to sets so that they could discuss philosophy. 73. In his first summer at the Bel-Air mansion where he lived, his friend Sharon Tate was brutally slaughtered by the Charles Manson a couple of blocks away. 74. Another victim of Charles Manson was Jay Sebring, who learned martial arts from Lee. 75. Bruce Lee’s death is still the subject of speculation, with many causes suggested including poisoning and paranormal intervention. The Tsim Sha Tsui rooftop where Bruce Lee was said to have had his last streetfight in Hong Kong.